Running, in any form, offers a cardiovascular and fat burning workout and requires only a quality pair of running shoes. A 150-pound person can burn 300 calories running at an easy 12-minute-mile pace for 30 minutes. If that pace were increased to a six-minute mile, the calorie burn would soar to 575 calories. To battle workout boredom, you can change up your routine with several different types of fat-burning running workouts. Check with your doctor before beginning any exercise program. Long slow distance runs, often referred to in the running world as LSD runs, are exactly what you would expect them to be; long distance runs at a slow pace. Your pace should be slow enough that you are able to talk without being winded, but fast enough that you are still challenging your cardiovascular system. These runs should range anywhere from 30 minutes to two hours in length. The longer the run, the more training adaptations your body is forced to make. The more time spent running, the more calories burned, thereby creating a caloric deficit, which results in fat loss. Interval training involves alternating bursts of intense activities with intervals of lighter activities that allow for recovery. This technique can be applied to any activity but is especially useful with running. Interval training can be incorporated during your regular run or you can perform sprints on a running track. During a regular run, you can simply keep an eye on your watch. 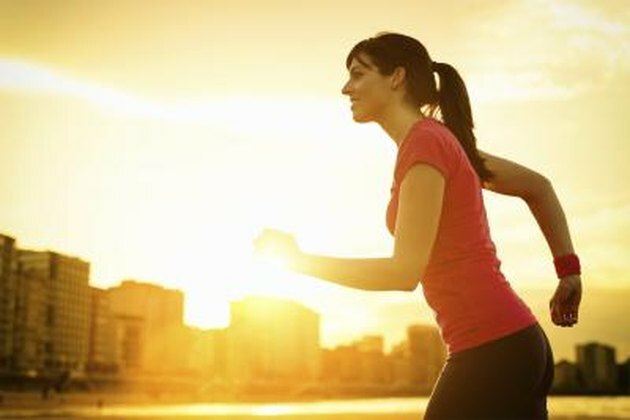 Run at a slower than normal pace for one minute and then increase your pace to just below a sprint for 30 seconds. Repeat the cycle for 20 to 30 minutes. If you prefer a running track, you can use the pre-measured distances. For example, sprint to the 200 meter mark, walk the next 100 meters, and then sprint another 200. You can choose the distance that is most comfortable to you. Perform five to 10 sets of the interval of your choosing. With hill training you use your own body weight as resistance and incorporate aspects of interval training. Hill training improves strength and power in your legs and elevates heart rate. Find a hill with a challenging slope that takes 30 to 90 seconds to ascend at a moderate running pace. Begin at the bottom and run up the hill as quickly as you can. Once you reach the top, turn and walk back down the hill. Repeat the climb six to eight times. Like interval training, hill training requires high intensity exercise, which boosts heart rate and thereby calorie burn. The more calories you burn during cardiovascular exercise, the more fat you lose. ACSM's Resource Manual For Guidelines For Exercise Testing And Prescription", Fifth Edition; Leonard A. Kaminsky, Phd, FACSM, et al. What Exercises Work the Best to Shred Belly Fat?